1 of 3 In a 5- to 6-quart slow cooker, combine onion, chicken, broth, green pepper, jalapeno, 1 1/2 tsp of the cumin and 1/4 tsp each of the cayenne and salt. Cover and cook on HIGH for 4 hours or LOW for 6 hours. 2 of 3 During the last 30 minutes of cooking, remove chicken to a cutting board and shred. 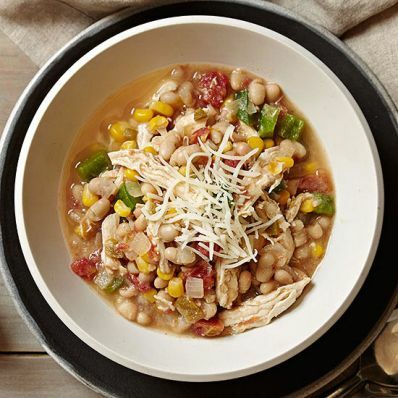 Return chicken to slow cooker with remaining 1/4 tsp each of the cumin and cayenne, the tomatoes, corn and beans. Gently mash some of the beans against side of bowl to thicken chili. Stir in cornmeal and remaining 1/2 tsp salt. 3 of 3 Sprinkle with Monterey Jack, if using.